Mitch McConnell prevented stronger action against Russian election meddling. 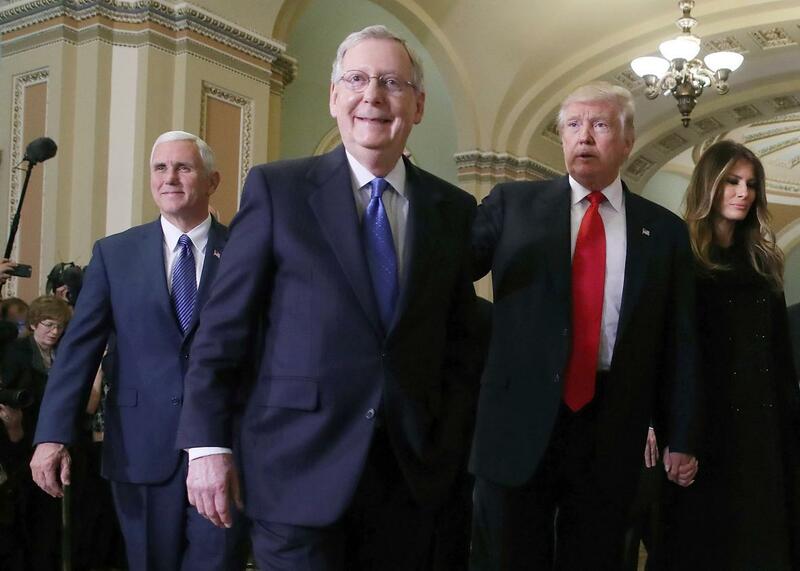 Senate Majority Leader Mitch McConnell with President-elect Donald Trump, his wife Melania, and VP–elect Mike Pence at the Capitol, Nov. 10, 2016 in Washington, D.C.
Senate Majority Leader Mitch McConnell was apparently one of the Republican leaders who was most responsible for putting the brakes on a stronger White House pushback against Moscow’s efforts at trying to affect the outcome of the U.S. election. At the end of a bombshell Washington Post piece about how the CIA has concluded that Russia was trying to help Donald Trump win the White House, there is word of a secret meeting on Capitol Hill with a group of key lawmakers in September. It was at this meeting that McConnell reportedly expressed serious reservations about the intelligence and threatened to politicize the agency’s findings if they were made public. The Post explains that the White House was so convinced by the evidence that Russia was trying to affect the outcome of the election that by mid-September, it decided that stronger action was needed. But White House officials were afraid that the effort would be seen as an attempt to affect the outcome of the election, so the administration wanted both parties to come together and criticize Russian interference as well as urge local governments to accept federal assistance in protecting the voting process. Trump has selected McConnell’s wife, Elaine Chao, to be his secretary of transportation, a position that requires congressional approval.